Bitcoin Press Release: Blockchain-based music sharing platform Voise have released the first-of-its-kind Masternodes on the Ethereum blockchain that will soon come online to provide extra services and revenue to token holders. This will accompany a token burn of 50 million VOISE tokens as part of continuous efforts to increase token value to backers. December 18, 2017 Barcelona, Spain – Decentralized music innovator Voise have announced further developments to its music sharing platform, including the introduction of Masternodes and a Token Burn. These aim to further enhance its reputation as a full-revenue platform with growing value for VOISE token, the digital asset native to the platform. Even as Voise works on improving its product after its alpha launch in October and securing new partnerships that have established Voise as a recognized brand in the music and blockchain industries, it continues to engage at length with the most important stakeholders: its community and token holders. As a result of the feedback and ideas from the community, Voise renews its commitment to profitability to Voise token holders with the launch of masternodes and a token burn. The Voise platform will soon allow token holders to establish masternodes, with operators earning a certain percentage of revenue based on the amount of VOISE tokens committed. Operators will be required to lock a minimum of 600,000 VOISE for a minimum of 30 days to qualify for minimum revenue, which they will receive after they unlock committed tokens completing the 30-day minimum period. All committed tokens will be locked by smart contracts operating on a special decentralized application (dAPP) which will govern the locking and distribution of revenue. Since these self-executing dAPP smart contracts’ back ends run on Ethereum’s decentralized peer-to-peer (P2P) network, the security of revenues are secured against access from even Voise developers. Voise can confirm that 80% of total revenue generated will be distributed among VOISE token holders. To reflect commitment to backers, in the likely event that income from the initial months of masternode operation is small, Voise commits to honor payments to the community, drawing from the foundation’s fund. To further add to the value of VOISE tokens by increasing its scarcity, Voise will initiate a token burn on December 24th, 2017. This will involve the burning of 50 million VOISE tokens, permanently reducing the circulating supply by about 8% – from 643,012,000 VOISE to 593,012,000 VOISE. This will also take the total supply of VOISE down from 825,578,000 to 775,578,000. As music artists and labels turn online to revive flagging sales, the online music industry has seen steady growth, with more than 110 million listeners happy to pay for their music online. However, the struggle remains, especially for indie artists, who have to contend with high commissions and disparate revenue distribution. Picking up from earlier attempts at developing decentralized platforms, Voise’s simple solution means that mainstream users can pick it up quickly, while crypto enthusiasts can find extra utility for a platform that accepts both crypto and fiat transactions. 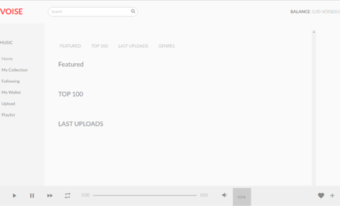 Users can access top music, popular download or listen to upcoming tracks from a thematic search engine. Through Radio DAO, the latest performers can find their first fans, while users reach first-hand Voise development updates. Music artists can use Voise to upload music and earn from any price they set or let users donate, with a feature-rich profile section a new channel to attract new fans. Endorsed by Grammy-nominated Carolyn Malachi and DJ sensation Jinco, Voise has also firmed up its business viability with partnerships with prestigious companies including MicroMoney and Coinomi. Voise recently joined the Ethereum Enterprise Alliance, gaining access to the world’s largest open source blockchain alliance, allowing it to engage with the best talents among Ethereum professionals within a network of Fortune 500 alumni. Already recognized for their intrinsic value, VOISE tokens are recording steady trading volumes thanks to successful listings on many leading cryptocurrency exchanges including Bit-z, CoinExchange and Cryptopia. VOISE is the source of this content. Virtual currency is not legal tender, is not backed by the government, and accounts and value balances are not subject to consumer protections. This press release is for informational purposes only. The information does not constitute investment advice or an offer to invest. The post Voise Releases World’s First Masternodes on the Ethereum Blockchain, Burns 50 Million VOISE Tokens to Decrease Supply appeared first on Bitcoin PR Buzz. Previous post: Healthureum: Blockchain And Healthcare Combined Seamlessly, Token Pre-Sale Begins December 16th.